The Whimsy challenge blog is celebrating Occasions Celebrations this week with a chance at a PRIZE - a good one!!!!! Make a card for any occasion - I chose to make one for a birthday of a friend. This friend is amazing - I met her in Kodiak and really look up to her! She is a great mother, great person and a wonderful friend! Her birthday is coming up this week too! I used the Whimsy duck on this card and decided that all ducks don't need to be a "normal" duck color. I wanted a FUN duck, so chose purple. I colored the duck with Copics markers and cut him out using my nesties. I used my new distressing tool to distress the edges of the paper. Come check out the Whimsy Challenge blog and join in!!!!!!!!!!! 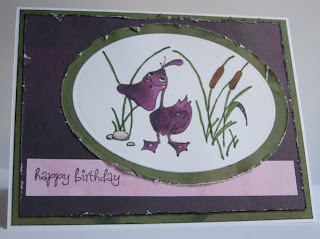 You just have to make an occasions Celebration card this week using Whimsy stamps. Purple suits him to a T! Fabulous card! Hahaha, that reminds me of Billy Madison "I've never seen a blue duck before". What a great movie! The card is super cute! I love the edges, it looks like a swamp or pond where a duck would be! I love it! too cute! love the purple duck. lol. Great Design! Have a fabulous day. Love your purple duck Lisa! Makes me want to taste him and see if he tastes like grapes. You should make him a scratch and sniff duck with grape KoolAid LOL the kids would love that!! Too CUTE! Haha! I love that purple duck! I love the purple duck....it makes him look elegant!!! That was my card!! Yay! Thank you for the compliment Lisa, you are AMAZING. I love seeing all that you are doing, I don't know how you have time---but keep it up, I am making a list of ideas to steal! lol.